But even though this could seem like a mere representation of what we can�t see for ourselves, beyond the persistence of vision, it connects with our most visceral side, combining the intangible beauty of the represented graphic with the brutality of the sound it produces, creating a hypnotic environment of audible results and unique visual stimulations." "Waves' utilizes a basic construction of a long piece of elastic string and two motors to visualize the presence of people close to the installation. The string between the two motorized chambers reacts to the people presence and movements, it twirls to produce a sine-wave simulation that eloquently resembles both the digitization of real-time sound waves and patterns of flow and connectivity found in natural systems. The simple act of making the "invisible" visible can produce profound effects in both our understanding of the world around us and the close relationship we have to the natural and built environment that we occupy daily. 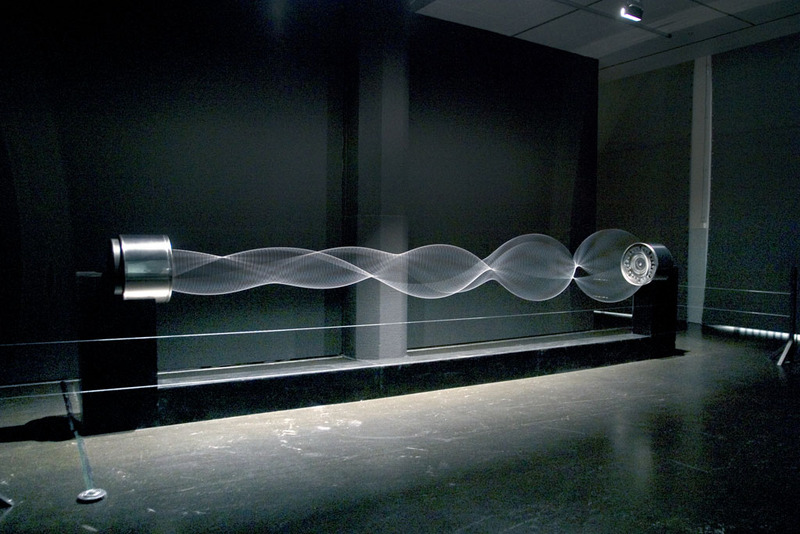 Although the project may seem like a simple visualization of intangible forms, it nevertheless connects to our visceral side by creating unique sound output and striking visual stimuli that engage with "persistence of vision" and our connection to the spaces we occupy and their sonic and electromagnetic inhabitants."